It’s the small things, the smallest boards, that often make my day! This is the MCP2221 breakout board (ADM00559), and it is my new Swiss Army Knife. If you are not familiar already with the MCP product line, these are generally simple connectivity and analog products, including Operational Amplifiers, Comparators, DACs, ADC, digital potentiometers, I/O expanders… Over the last ten years Microchip built quite a large portfolio of them. The MCP2221 in particular is the last derivative of a sub-family dedicated to (USB) connectivity and it offers a “USB to Serial” port bridge solution on steroids. The chip is small and really inexpensive, needs no crystal (uses the same Auto Clock Tuning feature found in the most recent generation of PIC16F1 devices) to provide Full Speed USB link and adds the ability to bridge to I2C as well (using a custom but simple HID interface). In fact the chip is too small for my general prototyping needs and that is where the breakout board comes to the rescue. 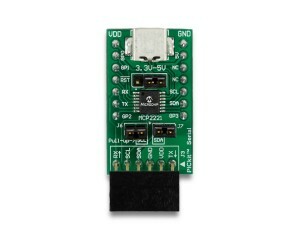 A mini-USB connector brings the power supply and data link. All signals are then conveniently presented in a dual in line (100mils spaced) 14-pin format ready to be used on a breadboard or pre-perforated prototyping area. Alternatively all the signals are brought to a single in line connector compatible with the PICKit Serial Analyser tool and therefore directly available for use with many existing demo boards (such as the PIC16F1 LV Evaluation Kit). Power (from the USB port) can be selected via a Jumper to be 3 or 5V (small LDO is included for the 3V option). Two more jumpers provide optional pull-ups for the I2C lines (if used). Additional pins can be used as GP I/Os under HID control. In short, this breakout board is so nice that I have recently used it for everything … literally, often simply to power (!) other demo boards (LPC, Simplicity…) and of course for adding (printf) debugging capabilities to a number of little projects/experiments. This entry was posted in I2C, Tips and Tricks, Tools and tagged I2C, Tools, USB. Bookmark the permalink.